Combination wet mop bucket and wringer is made of long-lasting, durable plastic with rust-resistant and corrosive-resistant parts. Set includes a side press wringer that accommodates up to 32 oz. mop heads. 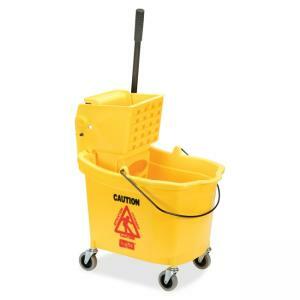 Mopping bucket features an innovative easy pour-grip and convenient lift handle and holds up to 35 quarts. Bucket has 3" commercial-grade casters with food grade/service-approved wheels.